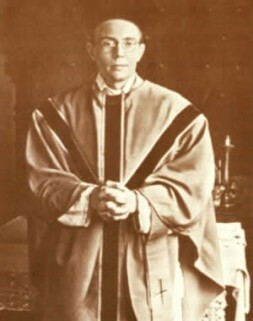 Sixty years ago, the terminally ill German Karl Leisner was ordained as a priest in the KZ Dachau near Munich. He knelt down in the small chapel of the concentration camp, before him the French bishop Gabriel Piguet. Surrounding him were priests from 20 nations, all prisoners of a totalitarian state on German soil. Priests who had themselves been imprisoned, worked for weeks to produce the vestments. Leisner, a deacon of the Lower Rhine, was arrested in 1939 because he had openly expressed regret that Adolf Hitler had survived an assassination attempt in Munich’s Bürgerbräukeller on November 8th, 1939. On December 26th, 1944—exactly 60 years ago—he celebrated his first and only Mass before succumbing to exhaustion. 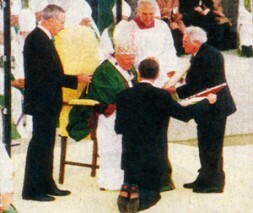 In 1996, Karl Leisner was beatified by Pope John Paul II. The Pope John Paul II offered him as an example: "Karl Leisner encourages us to remain on the way that is Christ. We must not grow weary, even if sometimes this way seems dark and demands sacrifice. Let us beware of false prophets who want to show us other ways. Christ is the way which leads to life. All other ways are detours or wrong paths." Recently, Catholics from all over Europe celebrated his ordination along with Cardinal Wetter of Munich—a beacon of light of a bygone, sinister and inhuman era? Karl Leisner lives on today—but for how long? He is an African in Darfur, an American in Cuba, an Asian in North Korea, a Persian in the totalitarian Iran of today. The world community loves honoring its foregone heroes, but is all too content to remain silent when it comes to preventing the death of the freedom fighters and heroes of today—and tomorrow. The World Security Network attempts to provide a small contribution to the waking of the world community. Each week, our newsletter goes out to 160,000 members of the global information elite in more than 80 countries of the earth, bringing information on new developments in conflict areas around the world. Our website www.worldsecuritynetwork.com presents daily the major events in the world which effect foreign and security politics. And we put forth concrete "Proposals" on how conflicts can be positively contained and eliminated. Please have a look! Our first World Security Scholar, the 19-year-old Dmitry Udalov from Moscow, visited New York and Washington D.C. this summer at our invitation. In November, WSN presented its most recent publication Fritz Kraemer on Excellence, Missionary, Mentor and Pentagon Strategist to enthusiastic audiences in Berlin, Munich, Washington D.C. and New York. We would be very pleased if you would continue to join with us in the coming year. Please support our work and become a Friend of Worldsecuritynetwork now !